Sometimes we have those “ah ha” moments when we realize we have found something we are passionate about. Over the past three years life circumstances have presented that have walked me down a path to my own personal “ah ha” moment. The details that got me here are irrelevant. The journey of a house-call veterinarian is different from those who choose to practice in a brick and mortar establishment. One is not better than the other, they are just different. 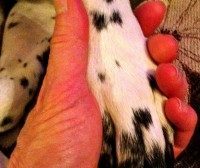 When I started my house-call practice 18 years ago, I carried with me the mindset of a traditional veterinarian. I pictured puppies and kittens, vaccines and routine surgeries, sick pet exams and diagnostics. What I hadn’t expected was the emotional and urgent need of pet owners seeking end of life care for their pets in critical condition. It’s not unique to the need of the pet and often it is necessary for the mental well being of the client. End of life decisions are complicated and stressful. A professional needs to help pet owners navigate through the decision making process with a clear and rational head. Clients often comment, “This must be the worst part of your job.” The truth is that yes, it is sad, emotional, and draining, but I find it rewarding. I take comfort in helping families navigate all phases of this very difficult process with compassion and dignity and putting the needs of the pet as my priority. I am one of a group of veterinarians who are guided by a belief that no animal should have to die in an animal hospital. I believe that passing peacefully in the home surrounded by familiar sights, sounds, smells and the touch of our loved ones is a job well done. Moving forward into 2015 I plan on focusing my efforts on pawspice (hospice), palliative and end of life care for pets. It is the right thing for them and I am honored to help pet parents in this process.